RMB’s love for the arts shows clearly in its incorporation of multiple artworks in and around its Merchant Place campus in Sandton. Art is part of the RMB DNA (which is one of the reasons we love working with the RMB team) and the bank is widely known for the support it lends to artists and the arts in general. If you’ve crossed the Merchant Place concourse in the past few days (on the corner of Rivonia Road and Fredman Drive), you’ll have spotted a new addition to the works on display: Africa’s Fearless Girl, sculpted by Marieke Prinsloo-Rowe. She stands proud and defiant alongside a lion which, if you look carefully, has a head at each end. These heads stand in constant vigil over the comings and goings around the bank. The lion itself is reminiscent the lion in the RMB logo. The Fearless Girl herself, as her name implies, is unafraid. Like her counterpart on Wall Street in New York’s financial district, she is independent, courageous and strong. She is alone, save for the beast in her immediate vicinity… yet clearly unfazed by the threat the beast poses. So if you’re in the Sandton area, do go and spend some time with Africa’s Fearless Girl. The double-sided lion also serves as a bench, which means you can take a seat and ask the girl to whisper her secrets of bravery into your ear. You might be surprised at how she inspires you. In March 2017, the iconic Fearless Girl statue by Kristen Visbal took its place on Wall Street, standing defiantly and staring down New York’s bronze ‘Charging Bull’ by Arturo Di Modica. Now, in 2018, it’s time for Africa’s own Fearless Girl to take a stand. 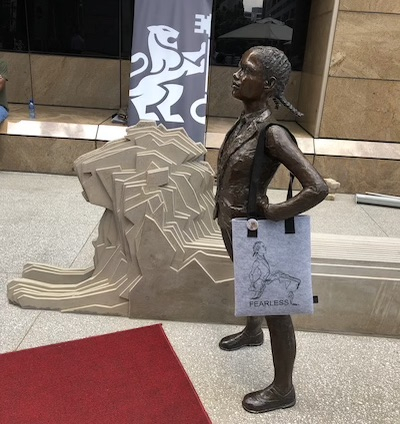 Commissioned by RMB and created by Cape Town-based artist Marieke Prinsloo-Rowe, the artwork shows a proud and courageous African teenage girl walking alongside a contemporary concrete lion. The lion doubles up as a functional bench, and invites viewers to sit and contemplate the ideals inherent in ‘fearless femininity’. 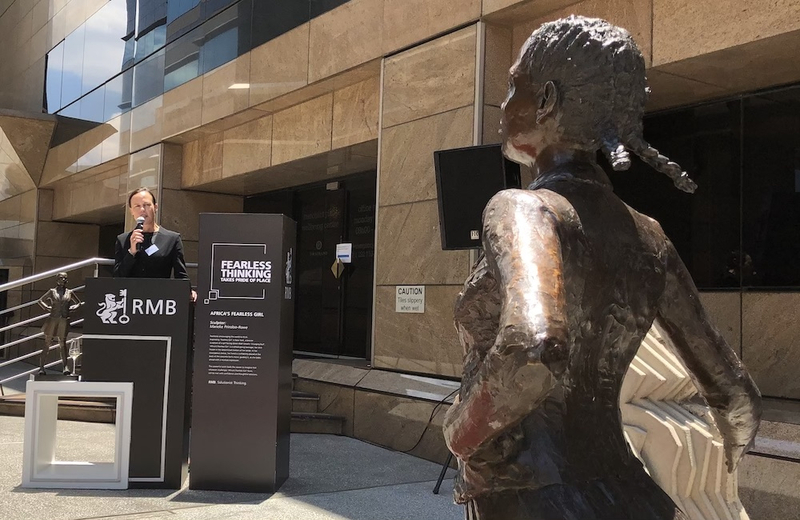 Having been inspired by Wall Street’s Fearless Girl, RMB envisioned a life-sized and Afro-centric version of the artwork that would speak to the values of individuality, courage and strength. After embarking on a nationwide search for female sculptors, Prinsloo-Rowe’s concept, which depicted a quintessentially African Fearless Girl walking alongside a male lion (which is a reference to the RMB brand’s ‘Lion and Key’ logo), captured this vision. The work, which debuted at the 2018 RMB Turbine Art Fair, now forms part of RMB’s Think Precinct collection and is an inspiring, functional, and engaging artwork to be enjoyed by RMB and all of its visitors. RMB CEO James Formby explains that when RMB invests in the arts, it is also investing in the lives of young artists and communities, and contributing towards the growth of the overall creative economy. And when it comes to transformation in the workplace, art can be a leading factor in how a company and its workforce communicates. Africa’s Fearless Girl complements the brand’s gender equality initiative Athena, first launched in 2015. Through the Athena initiative, RMB works towards creating an environment where women feel they are empowered to achieve their individual career goals; and growing the number of women in leadership in financial services. New York’s original Fearless Girl highlighted a need to change the perception of what it takes to create a successful company. This is what RMB wanted to create – but with a distinctly African narrative. Africa’s Fearless Girl takes her rightful place alongside the male lion, reiterating one of Athena’s key principles of not having to “man up” to have a successful career at RMB. Athena is, however, not a women’s conversation. Instead it is a business imperative with the clear agenda to focus on both men and women and the collaborative diversity they offer. This makes Africa’s Fearless Girl an incredible beacon of hope to young women in Africa – encouraging them to lead in their own authentic way. The addition of Fearless Girl to the Merchant Place campus also coincides with the international 16 Days of Activism Against Gender-Based Violence campaign. Linda Kachingwe-Sisya (pictured in the header image), who oversees RMB’s marketing portfolio for Africa, feels that ‘a woman’s place’ in society has become the narrative around women in Africa, despite them taking up leadership roles at presidential level, in parliaments and in boardrooms – alongside their traditional responsibilities at home and in the community. “Africa’s Fearless Girl is a constant reminder of the important role women play in positively influencing economies at all levels of society. RMB plans to extend her presence to some of our offices across Africa next year,” she says. In addition to the life-size statue, RMB commissioned a limited edition of 20 maquettes, 60 cm in height, which were launched at the RMB Turbine Art Fair. Such was the appeal of the narrative that Africa’s Fearless Girl conveys, that the full edition was sold out on the first evening of the fair. Reasons to purchase ranged from personal art-collecting to acquiring gifts for “fearless” female loved ones. Particularly meaningful, was the story of the St Anne’s Diocesan College Matric class of 2018, who collectively purchased edition number 14 to present to their school at their Matric farewell ceremony. The maquette will most likely find her home in the foyer of the new theatre complex at the school, due for completion in early 2019. 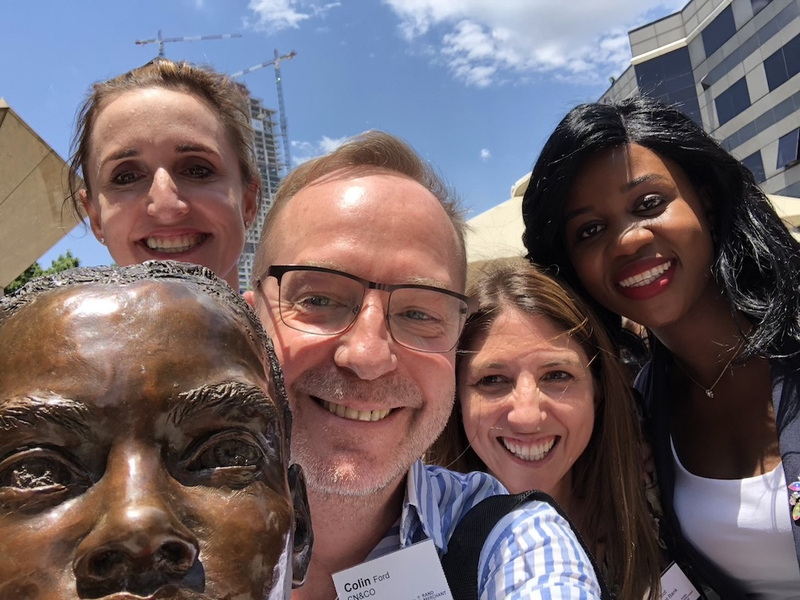 RMB believes that everywhere she goes, Africa’s Fearless Girl will serve as a visual reminder of an environment where all people are encouraged to fearlessly reach their potential; at the same time taking the equality conversation into society as well.